We don't promise pups to anyone until they are at least a month old and we know that they are healthy. We breed when we want to take something into the show ring and to continue with our breeding program. It goes without saying that we will have first choice of the puppies that we breed. We think that it is important to encourage new people to become involved with showing and breeding NZKC registered Bull Terriers. 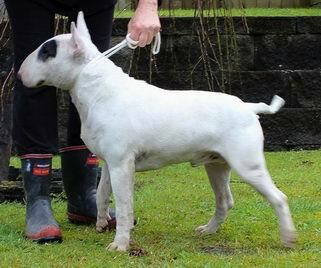 The dogs that we are seeing advertised as Bull Terriers (no pedigree papers) on trademe are getting further and further away from the breed standard which is a major concern for the future of the breed. It would be sad to see real Bull Terriers become a thing of the past. You would start out showing your dog and if you were interested, look at breeding later on. We are available to help and mentor you with each step in this process. You can either buy a pup outright to do this, or own one in partnership with us. There are many ways to work out a co-ownership and we are happy to discuss each individuals requirements. Or you can buy a puppy as a pet, to be desexed at an appropriate age. All pups have their births and pedigrees individually registered with the New Zealand Kennel Club. It is important for prospective Bull Terrier owners to know that they need socialisation and that 'off lead' dog parks are not recommended for the safety of your dog. We do not advocate leaving your Bull Terrier unsupervised with other pets . We recommend a secure kennel and run when you are not home with your dog. We also recommend that you purchase pet insurance once the 'free cover' that comes with your pup expires. We use the silver ribbon option offered by Southern Cross. Photos below are for illustration only, they are not for sale.